Daisy Mae is a 25” Lop eared bunny. She is made of Muslin with a grungy osnaburg dress. 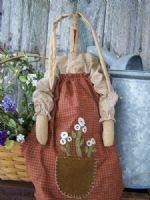 Her apron is a piece of Coral check homespun with a hand-embroidered basket of spring flowers. Each flower is a vintage white button that has been hand stitched on. Her face is embroidered. Daisy Mae can either sit or be hung up. 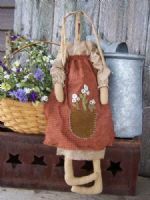 Very sweet primitive bunny to display this spring or all season long. Daisy Mae is also available as a pattern. See my Pattern page. $34.50. FREE SHIPPING IN 48 U.S. Others E-Mail me for shipping costs.